SGI partners with its customers to understand the current state and priorities for their grinding circuit. This method is ideal for new customers looking for a step change in their grinding costs and throughput targets. It’s also extended to our existing customers by improving our own performance with adjustments and optimizations to the grinding media being used. We deliver the size, grade and chemical composition in our grinding media according to a processing plant’s ore characteristics, milling methods and other objectives. Unique design is another hallmark of SGI grinding media that contributes to the highest performance standards. Our designs can perform better than the competition because of full activation in heat treatment. In other words, we get the full potential of the elements in our media because of superior heat treatment processes. This is our “no waste” policy. The micro-alloying process is carefully measured to meet each specific ball grade’s functional target. There is no general, all-purpose ball in our product range because there are no generic processing plants. The size of grinding media plays a key role in overall performance of the grinding circuit. Larger grinding media has a smaller grinding surface area, but offers a heavier weight that’s generally used to break larger ore. Small grinding media has a larger grinding surface area generally chosen to help make smaller ore smaller. In some cases, we find ourselves adjusting the ball size by the millimeter to approach optimization. Our knowledge and control of the ball’s design and manufacturing allows the flexibility to make such changes. Optimizing milling is part of our principle of continuous improvement. Hardness is a high priority to our clients, and our technical team has designed products for optimal hardness levels. The focus has primarily been to improve volumetric hardness to reduce wear rate through the life of the product. Surface hardness may only result in a few hours of good performance while linear hardness will produce consistency throughout the balls’ deployment. 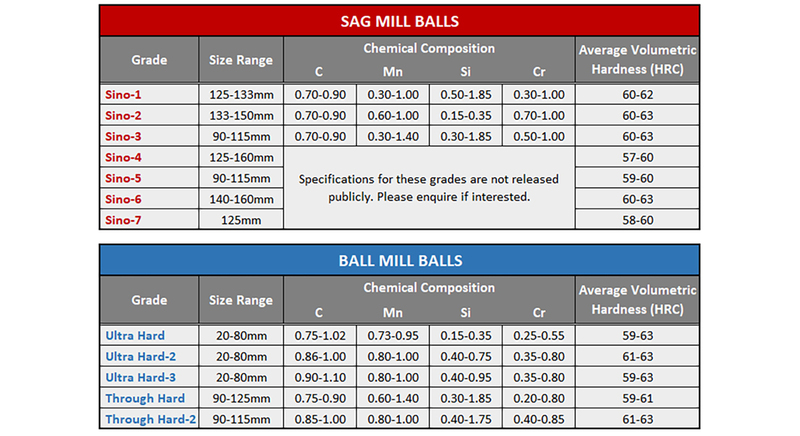 The specific ball design will balance hardness and toughness according to the milling targets in the operational plan. SGI will consider all the targets and environmental factors to supply a ball with <1% breakage. SGI products are designed for compatibility to blend sizes and grades to create an optimal ball charge of controlled ball size distribution. Even wear technology is another aspect of SGI products that ensures superior performance. The even wear allows for the new life potential of media rejected from ported SAG mills. The rejects are totally recyclable since the media retains their integrity for ongoing deployment in a secondary mill. Recycling to a ball mill as supplementary media or possibly as resale to other users provides additional value for our clients. Corrosion of grinding media can affect its longevity (internal structure) and performance. This is generally the case in mills where chemicals, water with an acidic pH level or the ore’s characteristics create a corrosive environment. A way to combat this is higher chromium content in the grinding media. Grinding media with higher chromium content has a longer life and generally holds its shape as it wears down compared to its low-chromium counterpart.